Nix-Hounds are insectoid creatures added by the Nix-Hound Creation. 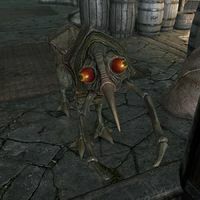 Originally native to Morrowind, they have been introduced to the island of Solstheim in recent years. For more information, see the lore article. Nix-Hounds drop a sample of Nix-Hound Meat when killed. 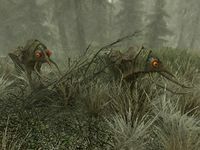 Wild Nix-Hound enemies can be found throughout the wilderness of Solstheim with this Creation installed. They can be found alone or in small groups, and will attack on sight. A pet Nix-Hound can be purchased from Revus Sarvani (or Geldis Sadri if Revus is already dead) as part of the related quest. The nix-hound is essential, and will not engage in combat. Its main function is to carry items, and it has a carry weight of 75 and it will follow you even if you already have another pet following you. You can instruct it to wait at a city, wait at its current location, wait at your house, or to carry items. It can also be summoned using a teleportation spell. The nix-hound cannot be detected by Detect Dead or Detect Life. If following you, it will occasionally give you a random ingredient[verification needed — need full list]. When this happens, you will receive a message saying, "Nix-Hound found something..."
My Pet Nix-Hound: Buy a tame nix-hound. Do not bring the nix-hound to Druadach Redoubt after siding with Madanach during the quest No One Escapes Cidhna Mine, as it will be hostile towards the friendly Forsworn there. Adding the nix-hound to the DruadachRedoubtFaction faction (RefID E3609) will fix this problem. This page was last modified on 1 September 2018, at 00:17.